First and foremost, I’m a father, husband, brother & son. My world revolves around my little girls and my wife. I’m a curious and restless person. When I was younger I wanted to be a writer; I wrote a lot, including a few books, one that I finished just out of high school. My interest in writing has never faded, but it’s become dormant – I’ll revisit it one day. Now that I run my own business and play father and husband, I dont have time to read much, let alone write. And it takes so much time. Instead I take photos. In many ways it’s a similar thing. I tell stories. I try to create beautiful things. I use my imagination, I explore, I try to capture moments, and manufacture things that will move people. I studied Journalism at university, because I wanted to write and to tell stories, and see things. After graduating I learnt pretty quickly that journalists don’t do much of this at all. So I went travelling. I was a little bit lost. I travelled for years, and during my travels I found two of the most important things in my life: my wife, and photography. I decided to keep both of them close for the rest of my life. When I returned to Australia, I studied photography and film. I had no idea I wanted to shoot weddings, but I did understand what I had always known: I wanted to use my imagination, my creativity, and I wanted to work for myself. After graduating, work didn’t come easy, and I did more study, this time to become a teacher. It wasn’t what I wanted to do, but I wasn’t sure I had much choice. While I studied, I shot a few weddings. I did them for next to nothing, for experience. My clients were happy. I looked around and realized that I could do a better job than my competitors. I didn’t raise my prices, but instead I shot dozens more weddings. I wanted to improve, and to learn. I studied the best wedding photographers in the world, I bought the best equipment. I got better. I’ve now shot more than 350 weddings. I’m still learning, and hopefully always will be. Along the way I’ve also shot wedding videos. They’re difficult and stressful, and if you want one you’ll need to twist my arm. But I do a few here and there, just to keep myself on my toes, to test myself and discover new things. I was asked once, by a prospective client, what my philosophy is. I found it an oddly disconcerting notion, that I should be able to distill my photographic approach into a few words – actually, into any words at all. Officially I call myself a Documentary Photographer. Or, probably because it borrows from my education, a Wedding Photojournalist. Neither of these titles are particularly accurate. In truth, I do whatever it takes at a wedding to get photos that I find most beautiful. Sometimes these photos involve me being an observer, hovering discreetly so I can snap the most unguarded moments. Sometimes they involve me rearranging furniture, manufacturing light, posing my muse, doing whatever it takes to get the shot I have in my head. I’m not precious, and I’m not vain. I let your guests take photos too. I don’t bully your relatives. I give you all the photos I take in high-res, without watermarks. I show up on time and never leave early. And I work hard. Because I’m only as good as the last wedding I shoot, and more than anything I want to make my clients happy. I’ve been featured in a bunch of magazines and on bridal websites, like The Lane, Polkadot Bride, Nouba, Junebug Weddings, North Coast Weddings, Fearless Photographers, Bula Bride, and won a bunch of awards, both at the AIPP and in overseas competitions, like Junebug's World’s 50 Best Wedding Photos of 2014, Junebug's World’s 50 Best Engagement Photos of 2015 & Junebug's World’s 50 Best Destination Photos of 2016. I’m easy-going, and I think I have the knack of making people relaxed. Probably the most common remark I get at the end of the night when I’m saying goodbye to the bride and groom is that I made everything so easy, that they felt very comfortable with me. Either that, or that they barely noticed I was there. Being photographed on your wedding day shouldn’t be a trial, and if it is, it’s being done wrong. The best photos happen when the bride and groom are at ease, and happy. I’ll do almost anything for my clients, but I prefer natural, simple photos. That’s just me. I spend a long time editing, and I give all my clients at least two versions of every single image. The minimum number of photos I deliver is 1000. I like to provide choice – photography is subjective, after all. So when all is said and done, what do you get? Well, to begin with, you get all your images in both color and black and white – every single one edited by me, with love. You get an online gallery, which is up for a minimum of 5 years, locked away in a password-protected cold cloud archive. This gallery is beautifully laid out, and you can share your images with friends and family with a simple link and password (or by clicking on the client gallery tab in my menu). All of the images are free for anyone to download, or you can order prints straight from the gallery itself. Speaking of which, you get $165 worth of gallery credit to kick off with, enough for fifty 5×7 prints or a combo of enlargements. As well as this, you’ll get a hand-crafted camphor USB package, lovingly put together with a wax-sealed letter and lots of nice little pretty things inside. Want to take your photos somewhere to get printed yourself? Not a problem – they’re all yours. Our wedding albums are the bee’s knees. They’re hand-made in the US, using fine art paper and rich and brilliant archival inks. Our albums are 12x12 inches, and come with a minimum of 25 spreads (50 pages) as standard. Cover options include genuine Italian leathers, with custom embossing at no extra. All packages include a USB, lovely wrapped in calico and boxed in oiled camphor, a sustainable timber sourced in the Byron Shire. Our suplier doesn't use farmed wood, and the trees are replaced with natural vegetation. All packages come with an online gallery, with full-res downloadable images and a print store. $165 worth of prints are included in the package. Order some prints and take them to your favourite framer. What sort of travel costs are involved? This depends on lots of things. Generally it's flights, 2-nights' accommodation and car hire, but I often do deals and specials, so the best bet is to get in touch and ask. You might be surprised! Again, this depends on the wedding and the hours booked and whether you have added a second photographer, but generally I deliver around 1500 (750 colour & 750 black and white). I have delivered over 4000 before. How do you deliver the images? And can we share them with friends/family? Absolutely. 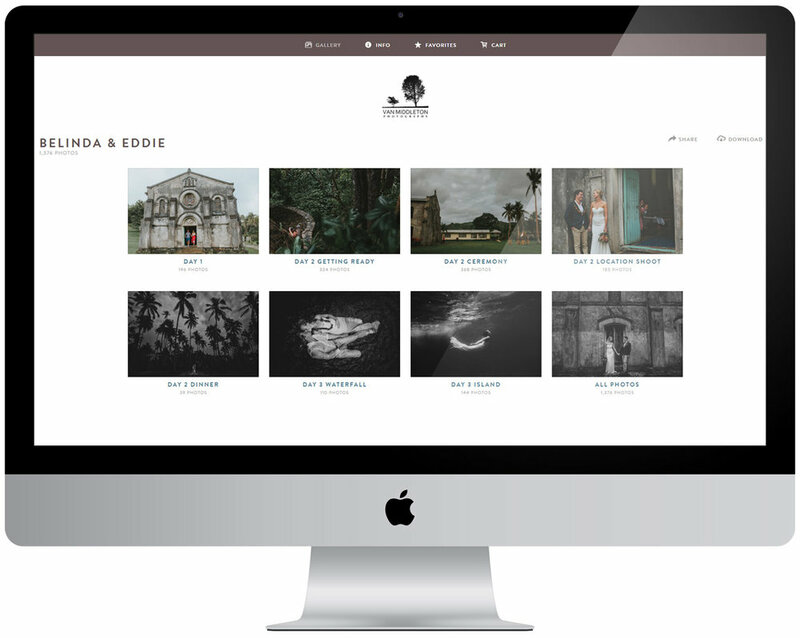 I deliver the photos in an online gallery, which doubles as both a backup archive for your memories, and also a great tool for sharing and showcasing your photos with loved ones. It's accessible via my client page, or a direct link, and only the people you share the password with can access it. It will be online for a minimum of 5 years. I also send out a custom camphor USB box. What about printing? Do we have the rights to our own photos? Yep. You can download them from your gallery in high-res and print them anywhere you want. You can send them to whoever you wish. Their yours. Can I see some example galleries? Of course. Hit me on the contact form and I'll send you some links. My main cameras are Fuji x-t2s and Fujinon lenses. I also sometimes use a pentax MF film camera. I have a backup camera with me at all times, and enough spare batteries and cards to supply a press corps for days. How safe are my photos? Do you back them up? I take great care to ensure that I never lose a single photo, and never will. My cameras write to two cards simultaneously, so I have an immediate backup every time I take a photo. As soon as I get home (or to my hotel room), I back up the photos again. In my office I have an NAS drive, which provides data protection - I use this for long-term storage of RAWs. I also backup the photos one extra time on a shock-proof drive and store this off-site, just in case something happens to my house. In total, I backup each photo I take 5 times - 7 times if you include the wooden USB and online gallery. No, but I can point you in the direction of some outstanding film-makers I often work and travel with. About 3-4 weeks from shoot day. The first album draft will be a few weeks after that. Yes. If your venue requires it, message us and we'll send you the details. What payment options to you offer? Three choices: paypal, direct bank transfer, or cash. Whatever works for you. $500, the rest due by or on the wedding day. What is your pricing and package options? Jump over to this page and check out the offerings.